Today’s text-to-speech (TTS) voices allow authors to add professional voice-over narration by themselves in presentations quickly and easily without microphone recording. Advances in text to speech technology have replaced the old robotic computer voices with new, amazingly natural and realistic ones. Synthesized from real voice talents, these remarkable text to speech voices can read books aloud beautifully without a mistake, guided only by grammar, sentence structure and punctuation. The exciting news is that these articulate text to speech voices have now been harnessed by Tuval Software Industries’ Speech-Over™ to add narration to PowerPoint presentations. Speech-Over accepts user narration text and launches text-to-speech voices from within PowerPoint to record professional narrations from the text alone. Change the narration text as often as you need and these tireless voices record new versions quickly and faithfully without complaint. 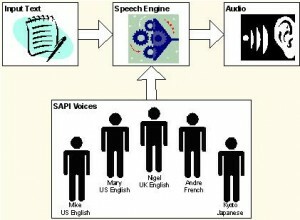 Text-to-speech voices are separate computer applications. They are available in male and female gender, in all major languages, and in various regional dialects. Many vendors offer text to speech voices, including AT&T, NeoSpeech, Cepstral, Acapela-Group and Nuance. Nowadays, TTS voices are embedded in many types of applications such as book-reading, GPS and kiosk software. Speech-Over is yet another example of software with embedded text to speech voices. Speech-Over recognizes any SAPI 5 standard TTS voice, a standard that most TTS voices adhere to. Tuval Software has a special arrangement to bundle Acapela TTS voices with Speech-Over software. The resulting product is Speech-Over Professional, a product that has all you need to create professional narration in presentations. It is available in all major languages. The use of text to speech voices is permitted by purchasing a license. Low cost TTS licenses are available for personal use such as reading books. However, when TTS voices are used in a commercial or corporate environment, an audio-distribution license is generally required and these are more expensive. The Acapela voices in Speech-Over Professional are provided with a commercial audio-distribution license included in the price. activates voice simulations to produce a vocal rendering of the text. The data for individual voices, including regional accents, are provided in separate files called "voices". The text to speech engine can work with any of the voices interchangeably. Today’s text to speech technology is much improved over that of even a few years ago. The older systems -- which produced the robotic-like sounds that people tend to associate with computer voices -- used the parametric or formant synthesis method to simulate the acoustic properties of speech. Recently, voices that use the concatenation method have become commercially available: the voice of a real human speaker is divided into phonemes, which are stored in the voice file. In a particular application, the text to speech engine assembles the phonemes according to the input text to reconstruct the original human voice to speak the text. Because a real human voice is used, it is sometimes hard to tell the difference between it and the real thing. Presentations whose purpose is to transfer knowledge are well-suited to text to speech technology. This type of presentation is usually given to people who have a need to receive and understand the information being presented, for example training presentations or corporate communications where text to speech voices are quite acceptable. Tuval Software Industries’ Speech-Over Professional is an efficient platform for integrating the text to speech system with PowerPoint. Speech editing for quick and easy entry and editing of speech text, including SAPI voice modulation tags, and association of speech with screen shape. Text can be typed in or dictated. Alternative narrations of a presentation for different audiences, including in different languages.